NACHC, with support from the Medtronic Foundation, completed a project on food insecurity, the state of being without reliable access to a sufficient quantity of affordable nutritious food. The Community Health Centers as Food Oasis Partners: Addressing Food Insecurity for Patients and Communities project sought to understand the depth and breadth of what health centers do every day to assure their patients and communities have access to nutritious food. The project aimed to gain insight into innovative and promising practices, to collect and share examples of program designs that are replicable and sustainable and to understand ways in which food security interventions are impacting health outcomes in target populations. 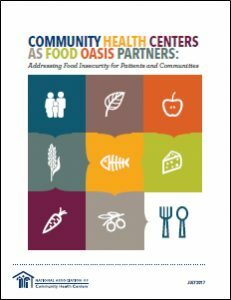 The Community Health Centers as Food Oasis Partners: Addressing Food Insecurity for Patients and Communities report summarizes the findings of the Community Health Centers as Food Oasis Partners project. Explore selected sections below or download the full publication. This nine-minute video features the patients and staff of Community Health Service Agency, Inc., in Greenville, Texas; Mountain Comprehensive Health Corporation in Whitesburg, Kentucky; and Native Health in Phoenix, Arizona. This three-part podcast series explores the food insecurity programs at Brockton Neighborhood Health Center in Brockton, Massachusetts; Native Health in Phoenix, Arizona; and Bread for the City in Washington, D.C. This report reviews existing and emerging opportunities to document food insecurity screening, assessment, intervention, and billing for each part of a patient visit using discrete codes and language from standardized EHR medical vocabularies. NACHC and partners supported 10 health centers in 9 states working on improving health outcomes for their LGBT patients. Health center quality improvement teams participated in a practice improvement collaborative, and each health center had a provider champion attend a bi-weekly Project ECHO meeting focused on LGBT health. Much of the work included training staff to provide clinically appropriate, culturally responsible care, creating a physical environment that is welcoming to all patients including LGBT patients, collecting patient sexual orientation and gender identity data, and engaging patients in conversations about their sexual health. 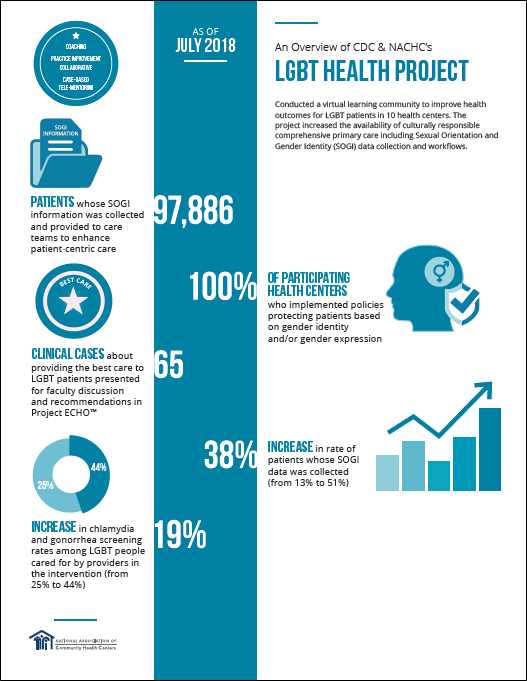 The Transforming Primary Care for LGBT People Toolkit compiles promising practices around identifying LGBT patients and engaging LGBT patients in culturally responsible, clinically competent care. Priority interventions are supported with implementation tips, tools, and resources. The Denver Prevention Training Center (Denver PTC), which provides no-cost training and consultation to health centers to improve HIV prevention efforts, worked with NACHC for the past four years to enhance HIV prevention in our nation’s health centers. Most recently, Denver PTC and NACHC worked with health centers and the Community Health Center Association of Mississippi on a technical assistance intervention to improve syphilis screening and treatment of asymptomatic patients.